There is a need for a purpose-built system for naturalistic, acoustic piano sound. I want to build that system. Please sign up for my mailing list to let me know if this is something that interests you; I’ll send you updates as the project progresses. This means that sound problems don’t originate in the piano samples themselves, but are instead an artefact of the live sound system. The quality of piano samples does vary — some are clearly better than others — but the fact that most players are happy with their sound in headphones shows that piano samples themselves are not the root cause of players’ frustration. Polyphonic interference. When playing a chord, different notes will typically generate harmonics that share a common frequency. Phase differences between these harmonics can lead to phase cancellation, depending on small differences in timing (on the order of milliseconds) between the struck notes. This causes random (sometimes unpleasant) changes in timbre from one sounding of a chord to the next. Measurements demonstrating this effect are shown in this post. Loudspeaker resonances. Unless great care is taken in loudspeaker design, there will be audible resonances due to e.g. standing waves in the cabinet or in the throat of a horn, so some pitches (or their harmonics) will sound much louder than others. Live piano seems to be especially revealing of these resonances, which are the cause of the harsh, strident, “ice-pick-in-the-ear” effects that many players complain of. 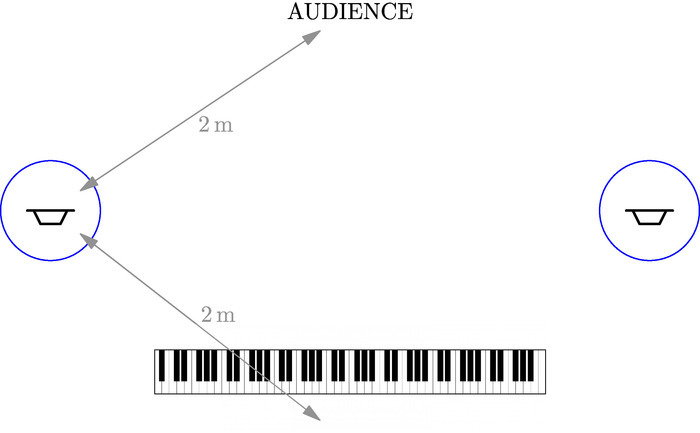 Most common seems to be a resonance around 1kHz that gives a piercing quality to a few notes around high C.
These criteria are great for speech intelligibility and for performance in large venues, but they contribute to bad piano sound in at least three ways. First, and most obviously, a piano invariably sounds too “dry” when played through an amp / PA without reverb, because the sound system provides very little in the way of room reflections and natural reverberation — quite unlike an acoustic piano. With acoustic piano we actually do want to approximate a live experience. This changes the design goal entirely, favoring relatively high levels of reverberant sound and early lateral reflections  — precisely the opposite of what typical keyboard amps and PAs aim to do. Adding synthetic reverb helps, but it often sounds unnatural: the human ear is pretty good at detecting the mismatch between synthetic reverb and the natural reverberation of a room. More importantly, and unfortunately for stereo piano, a high level of direct sound presents a worst-case acoustical sum of left and right channels at the listener’s ears. This causes audible comb filtering due to inter-channel phase differences, which the room reflections and reverberation are too weak to mask. (Playing in summed-to-mono is even worse than stereo, since in this case the comb filtering is introduced at the source, preventing any masking that would otherwise be provided by room reflections.) Reverb doesn’t help here, since inter-channel phase differences at the piano’s outputs will persist even after reverb is applied. Finally, prioritizing high output and highly directional sound favors loudspeakers that use inherently resonant elements, e.g. an under-damped woofer cabinet and/or horn-loaded tweeter. These are efficient and plenty loud but the resulting spectral problems are hardly flattering to piano sounds, tending to make them harsh or strident. All of this suggests the need for a sound system designed along lines quite different from a typical keyboard amp / PA. The primary goal is to avoid audible comb filtering. This is most easily done by playing in mono, using only one of the keyboard’s outputs (and defeating the sum-to-mono behavior of the L-MONO jack by plugging a dummy cable into the unused output jack). Neither the left nor right channel alone captures a good representation of the piano’s timbre. As I showed in another post both channels on my Yamaha CP50 suffer from spectral artefacts. (This isn’t surprising: a piano is a huge instrument; its near-field response at any point is bound to be corrupted by interference from reflections from the lid and body.) But by playing both channels, harmonic deficiencies in one channel can be compensated by the other. Phase cancellation due to polyphonic interference typically occurs in only one channel at a time. Again, by playing both channels the spectral deficiencies in one will tend to be filled in by the other. Reproducing both channels at different points in the room creates a more “complex” sound field, presenting somewhat different waveforms at each ear. This increases the listener’s perception of spaciousness and envelopment, which are highly prized elements of live performance . The downside of playing in stereo is that phase cancellation (comb filtering) is inevitable where the two channels sum acoustically at the listener’s ears. Fortunately this artefact can be masked by a sufficiently high level of reverberant field . Most keyboard amps / PAs are unable to do this, since they aim to avoid exciting the reverberant field. Instead, for playing in stereo we need a source that projects a relatively low level of direct sound (though not so low as to obscure articulation and timing) and excites the reverberant field to a greater degree. As a bonus, a sound system designed for increased reverberant level will not only mask comb filtering, it will also tend increase the level of early lateral reflections. This promotes the highly pleasant perceptions of spaciousness and envelopment associated with live acoustic performances . Since both direct and reverberant fields will play a significant role in perceived timbre, the loudspeaker should be equalized in terms of both power response and direct response. This favors the use of constant-directivity loudspeakers, since these radiate the same spectrum in both the direct field and power response. Of these, the most common (and easiest to implement) are omni-directional (monopole) and dipole radiators. An omni-directional loudspeaker aims to approximate a point source (monopole) which radiates the same intensity in all directions, at all frequencies. Compared with a more directional loudspeaker, this puts more acoustic energy into the reverberant field, raising its level by several dB. Small studio monitors (the ones with a 5″ or 6″ woofer) are often fairly omni-directional, which might explain why some players have had success with these. Ideally the direct-to-reverberant ratio should be adjustable, allowing for adaptation to the room acoustics and personal taste. This isn’t possible with an omni loudspeaker, but it does become possible with a dipole radiator. To reduce the direct level below that of an omni source we need a source that directs sound primarily away from the listener (i.e. a loudspeaker with negative directivity). One way to implement this would be a pair of dipole loudspeakers (which radiate a figure-eight pattern) with the following layout. The dipole radiation pattern is shown in blue. The player is near the dipole null and so receives a low level of direct sound. The graph above indicates that at 75° off-axis, the direct sound is at least 6dB below the reverberant field even at distances less than 1m. I’ve experimented with this setup using a pair of Linkwitz Lab LX521 dipole loudspeakers with my Yamaha CP50 stage piano. The results are excellent: for the first time I can play live in stereo without audible comb filtering, and the sound compares favorably to the experience in headphones. Also, as expected, even without added reverb there is a pleasant sense of spaciousness, envelopment and natural reverberation. Synthetic reverb is redundant. Alas, dipole loudspeakers are a significant engineering challenge to design and execute, so cost becomes a significant factor (e.g. at the time of writing, components for a DIY version of the LX521 cost over $5000). I’m convinced that a stereo pair of dipole loudspeakers is the best way to reproduce stereo piano samples in live performance. The downside of this approach is cost and complexity. I’m working on a dipole implementation customized for this application, with the goal of making something portable and affordable. Please let me know if this is something that interests you: sign up for my mailing list and I’ll contact you directly with updates. Floyd E. Toole, “Sound Reproduction: The Acoustics and Psychoacoustics of Loudspeakers and Rooms.” Focal Press, 2008. Søren Bech, “Timbral Aspects of Reproduced Sound in Small Rooms.” Journal of the Acoustical Society of America 97(3), p.1717-1726, 1995. Richard, thanks for a well-thought-out post! I think, for the purposes of near player setup in a small room LXmini+ (LXmini plus LXsub) should be enough, and they can be built much cheaper than LX521. The toeing of dipole speakers on your picture looks unusual. Are they intentionally toed out? Where are the walls on the figure? Nice idea. I haven’t built the LXmini but did experiment with the Pluto and found that the near-player direct-sound level was too high, for reasons discussed above. I also built an experimental loudspeaker with a radiation pattern much like the LXmini — omni at low freq, transitioning to cardioid but with most of the energy directed away from the player. This was better in terms of raising the reverberant level. But the transition to omni at low freq created a muddy, bottom-heavy sound that I couldn’t fix with EQ. I wonder if the LXmini would lead to the same issue? Yes, the toe out in the picture is intentional. The conventional toe in raises the level of direct field in the audience — the opposite of what I’m trying to accomplish. The toe out also increases the relative level of reflections from side walls, which is a good thing in this application. Research quoted in Toole’s book suggests that listeners consistently prefer lateral reflections whose level is higher than the direct sound. Richard, you are right about the radiation pattern of standalone LXminis, but since they start rolling off at 40-45 Hz, alone they can’t be used for reproducing full piano frequency range. What I was talking about is LXmini + Linkwitz subs. There are two models: one is LXsub4, same as in LX521, another is LXsub (single-driver version). Both models are dipoles. The resulting systems are called LXstudio and LXmini+2. OK I follow you, but all the same I don’t think a sub is necessary. In theory a piano goes down to 28Hz but there’s actually very little energy below 60Hz. In another post I show measurements where I mic’d a 6′ grand and recorded some stuff using the full range of the keyboard. After applying a 60Hz low-pass filter (to derive the signal that would go to the sub) the waveform has peaks that are typically 40dB below the original. So it seems unlikely that I would miss having the sub. If I try really hard I can get the sub-60Hz signal up to -20dB, which might be worth reproducing. But I’ve never played the instrument that way in a musical context. Thanks for yet another very interesting and useful post! Even though I don’t have a specific interest in electronic pianos, I find your insight into acoustical effects extremely valuable. I just wanted to suggest that other DIY options than SL’s LX521 exist, which could be a better fit for smaller wallets. An example is Visaton’s NoBox170, which can be built for around $500 a pair and driven with a simple stereo amp. It does have its shortcomings (notably the non-quite-symmetrical and therefore non-quite-dipolar structure), and certainly doesn’t have the same output capability as the LX521, but for domestic use it could be a very cost-effective option to the same effect. Let me also take this opportunity to belatedly thank you for all the bits and pieces you shared on using PC-based DSP to drive multi-way system. I found them invaluable in my own speaker prototyping endeavours. Thanks for the positive comments! I’ll look into the options you suggest. The not-quite-dipole pattern is likely a problem for me, as I want to put listeners pretty far off-axis. 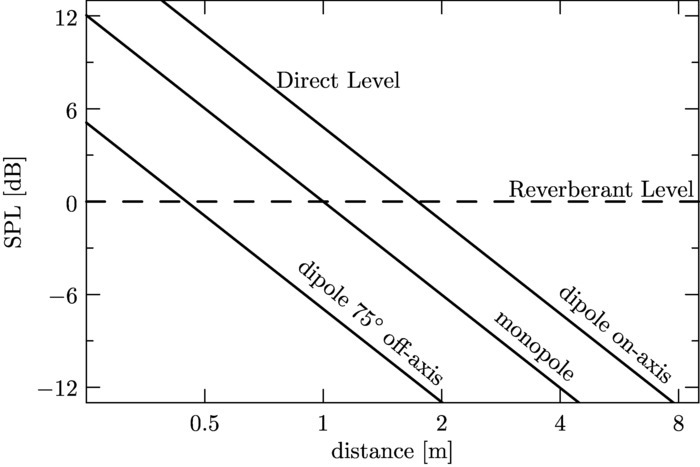 Even the very well-executed dipole designs have an irregular response anywhere near 90 degrees off-axis: the null is never perfect, and tends to move around with changing frequency. I’m working on a design aimed at better-behaved off-axis response; I’ll post about it here when I get the wrinkles worked out.